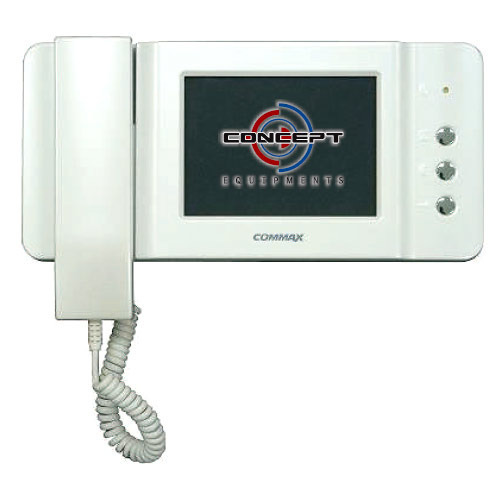 Special elegant color video door developed for 40th (at the 2008) year establishment anniversary of Commax. Slim design and best appearance tog ether with best price will make comfortable of your residency. Affordable Color Video Door phone monitor. The new CDV-50P has changed this. Now premium color video is available at the cost basic B&W video door phone. Formed in the year 1995, our organization is touching new heights of success in the domain of trading and supplying Security Systems and other Office Automation Products. Our range includes IP Cube Cameras, High Res A/IV/F Cameras, Weather Proof IR Cameras, WDR Box Cameras, Day Night Box Cameras, IRIS Scanners, Face Scanners, Proximity Cards and Smart Cards. Apart from this, we offer Intrusion/Burglar Alarm, Perimeter Beam Detector, Boom Barrier, Retractable Bollard, Tripo/Turnstile, Fire/Smoke Panels, Building Intercom, Video Door Phone, PDA Viewer, Standalone DVR and 4 Channel IP Server. These security systems & office automation products have gained huge acclamation in the market for their optimum performance, minimum maintenance, easy installation, precise designs and longer service life. Furthermore, we provide e-commerce solutions, consultancy, web based applications and services for BPO. We source our products from credible vendors of the market who make use of high-grade raw material in the manufacturing process. Additionally, they use ultra-modern machines and technology for manufacturing these products as per the latest quality norms of industry. Our products are delivered at the customers' end only after their proper testing. In addition, our security systems & office automation products are packed with utmost care and stored in the warehouse till their final delivery.